Kelley, a Democrat elected state auditor in 2012, was convicted last year on nine of 14 felony charges during his second trial on theft, fraud, tax evasion and money laundering charges. 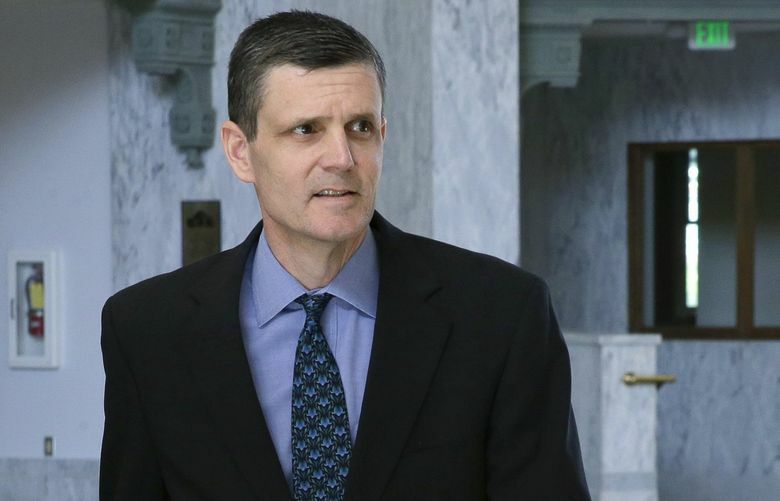 A federal judge has refused to grant former Washington State Auditor Troy Kelley a third trial on charges that he stole millions, a few hundred dollars at a time, from clients of his now-shuttered real estate closing-fee company. U.S. District Judge Ronald Leighton, who presided over both of the previous trials, rejected defense arguments that the court was growing fatigued of the litigation and, like an umpire in an extra-innings baseball game, was making decisions aimed at ending the case rather than addressing prosecution missteps at the second trial. Leighton noted that the motion filed by Kelley’s Seattle attorney, Angelo Calfo, was the 619th docket entry in the hard-fought case. Kelley is set to appear for sentencing before Leighton June 29, where he faces up to 20 years in prison. Kelley was convicted last year on nine of 14 felony charges by a federal jury in Tacoma during his second trial on theft, fraud, tax evasion and money laundering charges. Jurors rejected the money laundering charges, but found Kelley guilty of possession of stolen property, tax fraud and making false statements. Prosecutors allege he stole millions from homebuyers during the pre-recession real estate boom by failing to make refunds to clients of his now-shuttered real estate reconveyance company, Post Closing Department. During his first trial in 2016, Kelley and his defense team fought federal prosecutors to a standstill, winning an acquittal on one count and a deadlocked panel on the remaining counts. Kelley, an attorney and lieutenant colonel with the Army National Guard, was elected as a Democrat to the position of state auditor in 2012. Both trials were was bitter and hard-fought, with conflicting testimony by expert witnesses, hundreds of exhibits and complex explanations of the real estate escrow process. Kelley’s attorneys contended that he was being targeted by federal agents being pressured to make a case against him. Gov. Jay Inslee and other state officials called for Kelley to step down. Kelley took seven months of leave amid his prosecution and did not seek re-election. State Attorney General Bob Ferguson launched his own investigation after it was learned that Kelley had hired a former business partner for a long-distance, part-time state job. No charges have resulted. During his first trial, Kelley’s defense ground away at every prosecution witness and inconsistency in the government’s case, returning time and again to a big one: that Kelley and his business, Post Closing Department, were not alone in the freewheeling real estate market at the time not refunding unspent fees. Kelley had carved out a lucrative niche in the real estate market, providing lenders and mortgage companies with a service that involved filing and tracking reconveyance documents during real-estate transactions. Prosecutors allege that Kelley agreed to charge a fee of between $15 and $20 for each transaction. The escrow companies, however, paid Post Closing Department as much as $140 for each job, with the extra money available to pay other expenses such as recording fees. Prosecutors allege the difference — a total of as much as $3 million — should have been refunded but was instead kept by Kelley, a practice that amounted to theft. Kelley came under investigation by the IRS and the FBI after his successful 2012 campaign for auditor when his opponent pointed to a 2009 lawsuit alleging that Post Closing Department failed to refund the real estate fees to homebuyers. A grand jury in 2015 made him the first state official indicted in more than 40 years.